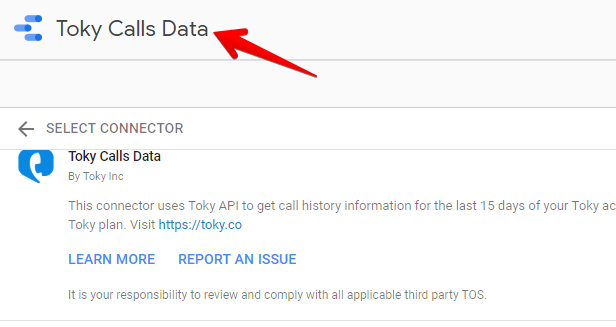 Google Data Studio is a free reporting tool which you can use to easily create dashboards and reports. You can create unlimited free reports and dashboards connected to several data sources; the reports created can be edited and shared with few clicks. 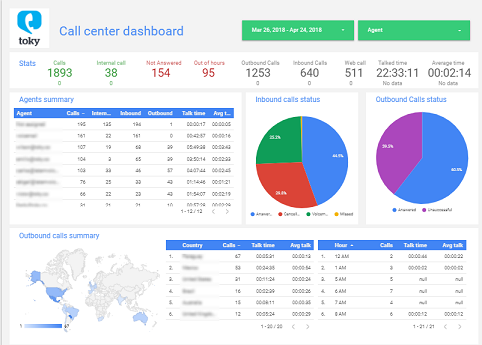 You can add your own tables and charts and with our Toky Connector you can design your own call center reports with your logo, corporate colors and monitoring your defined KPI. 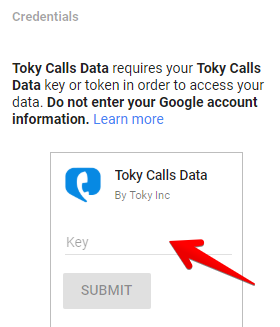 Our Data Studio Connector will allow you to get the last 15 days of call data from your Toky account, using your API Key. 1. 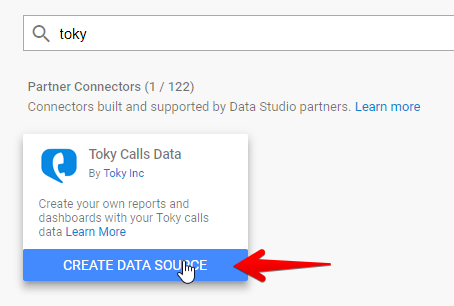 Go to Google Data Studio and add a new Data source. You can click on this link to go directly. 3. Rename the Data Source, so you can identify it later. 6. 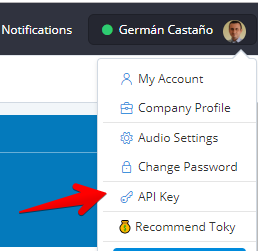 Paste the copied Toky API Key in the field Key and click on SUBMIT. 7. Enter the connector parameters following the steps in the next section. Working time starting hour: Enter the starting working hour for your business in 24h format, for example 6 for 6am, 8 for 8 am etc. Working time ending hour: Enter the final working hour for your business in 24h format, for example 18 for 6pm, 20 for 8 pm etc. Number of days back to load in the report: This report load data from the actual day until some days in the past. In this parameter you can define how many days do you want to load from 0 to 15 days. 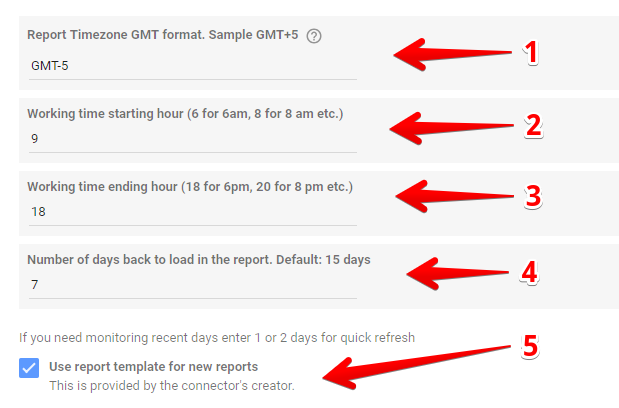 If you want just monitoring the actual day you can ask 1 or 2 days back and the report will load faster. 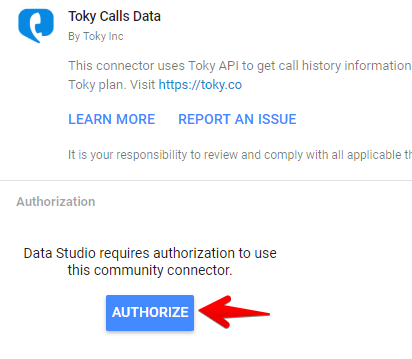 Use template by default: Check this option to add the template report designed for us so you can start monitoring your call center. These are the fields you can use in the report to show as tables, charts or pivot tables. Call Source: Source of the call, it can be a phone number or any agent identifier. Answered: Inbound or outbound call successfully answered. Missed: Inbound call not answered. Voicemail: Inbound call where the caller left a voicemail. Cancelled: Inbound call where the caller ended the call before being connected to an agent or even to our system. Unsuccessful: Outbound calls not answered by the receiver, maybe because the phone number was busy, or the call was ended before being answered.